[I learned] very technical stuff, like how do you move, how do you patrol, what are the rules to work as a team, and what is expected of the captain, and how to talk to your guys. But the most important part was to hear their experiences. What goes through your mind when you’re in the middle of nowhere fighting against an enemy that believes as much [in their cause] as you believe in your cause. It was interesting to hear what keeps you sane, and what happens when they capture you, and what happens when you capture someone. It was helpful, not just for the film, but also to understand the world we live in. It was interesting to listen to them and find the humanity in these characters. I wanted to portray a real character. Gareth [Edwards] kept stressing, yes, we’re in a galaxy far away, but it has to feel very close to us. It has to be very realistic. The journey, we have to live it with a proximity that is almost uncomfortable, with a lot of intimate moments. The film balances between these amazing epic stuff that Star Wars always has, and moments that are very like, you’re sneaking into the lives of these people and you’re breathing the air that they’re breathing. 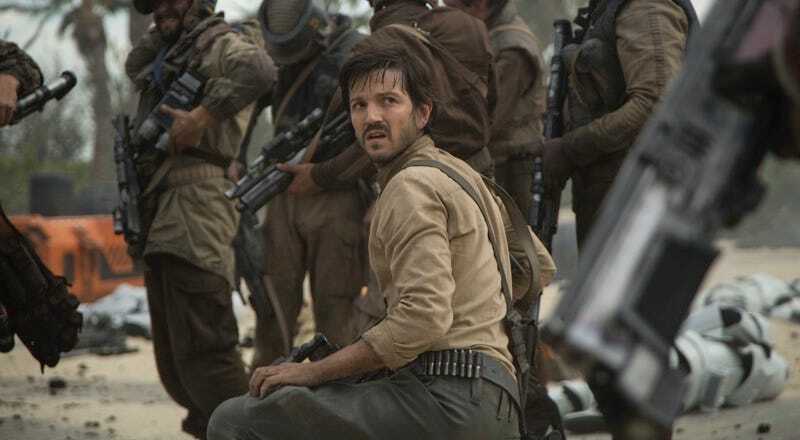 It’s safe to assume that some of Cassian’s quieter moments are shared with Alan Tudyk’s K-2SO, the Imperial droid who the captain has reprogrammed, and is now his best friend. Just watching Luna and Tudyk interact at the press conference (lots of good-natured ribbing flying back and forth), you can tell that the friendship has continued off-screen. His humor is so sharp and sarcastic. It’s just so much fun. Because there was so much pressure sometimes, it was great to be able to relax a little bit and laugh, and remind ourselves how lucky we were. Alan was great at that, and he’s just a very generous person. He understands the big difference between thinking this is a race you’re doing by yourself, or how much this job depends on your partners. It’s about the ping-pong you can play, you know? Luna counts himself lucky to have been a part of a cast with not just Tudyk, but also Felicity Jones, who plays Jyn Erso. “I always say Alan and Felicity, because that’s how everything started. It was the three of us stepping into this gigantic universe.” While the experience was often overwhelming, Luna counts them all as “the luckiest actors ever,” however. Rogue One: A Star Wars Story is out December 16.